Rc.No.16 dt.08.06.2018; Permission to avail Optional Holiday on 12.06.2018 on account of "SHAB E QADAR" by Muslim Teachers. School Education Permission to avail Optional Holiday on 12th June. 2018 on account of SHAB E QADAR" by the Muslim Teachers Re Opening / Reporting day as 13th June, 2018 Accorded. 2. Representation dated: 07.06.2018 of Sri. Sk. Kaleem. President Minority Teachers Assoctation. A.P., Amaravati. 3. Letter Dated: 07.06.2018 of Dr. A.S. Rama Krishna. Hon'ble MLC along with encloses. 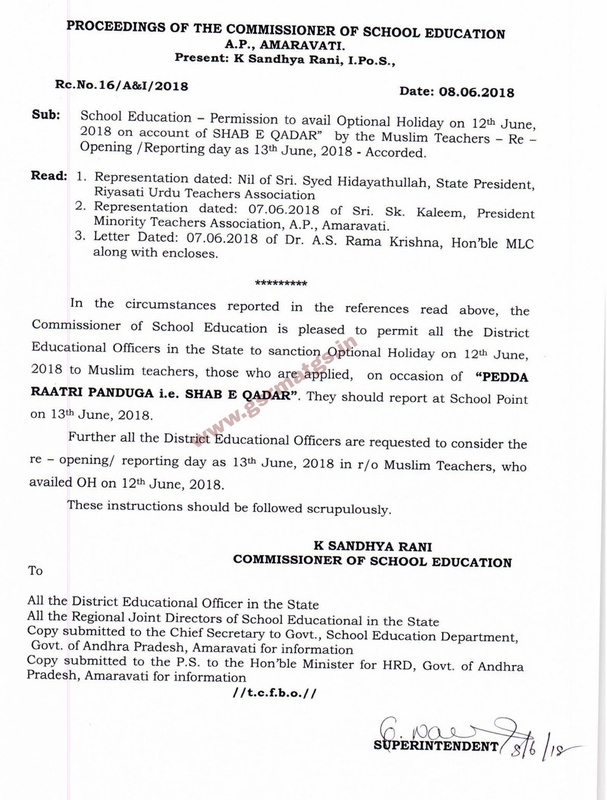 In the circumstances reported in the references read above, the Commissioner of School Education is pleased to permit all the District Educational Officers in the State to sanction Optional Holiday on 120' June, 2018 to Muslim teachers, those who are applied, on occasion of “PEDDA RAA‘I‘RI PANDUGA Le. SHAB E QADAR". They should report at School Point on 130' June, 2018. Further all the District Educational Officers are requested to consider the re opening reporting day as 13th June, 2018 in Muslim Teachers, who availed OH on 12th June, 2018. These instructions should be followed scrupulously.